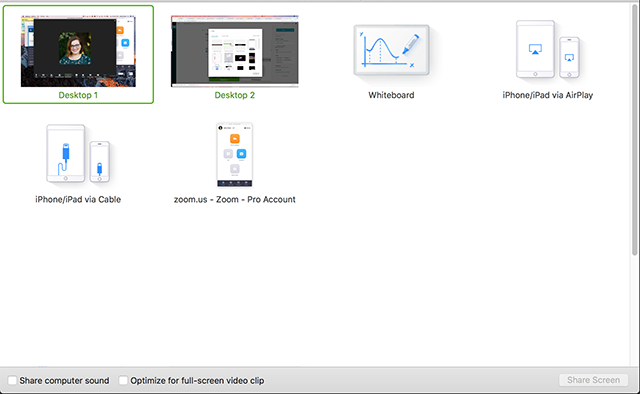 If you would like to start an instant meeting for screen share (no video) or an audio-only meeting, you can do so by selecting the "Start with no video" at the Home tab. After selecting "Start without Video" your meeting will start. Audio Conference: Meet with no video or content sharing(audio only). Invite Others: Send invitations for others to join your meeting. Note: Video is not automatically turned on during a screen share meeting. You will need to "Start" your video/camera during the meeting. Once you click on share screen, you will be prompted to select the desktop, a specific window or an iPhone/iPad app to share. During screen sharing, you can switch between different Windows or Desktop by moving your mouse/pointer to the top of the meeting window. Select - " New Share"
Other options during screen sharing includes- mouse/keyboard control, annotate, record, mute, chat, etc.. Click here to learn more about available features during Screen Sharing. To end your screen share meeting simply select "Stop Share." Leave meeting - Leave the meeting but, leave the meeting open and running. End the meeting for all - As the "Host" you can choose to End the meeting. To start your video during your screen share meeting, select the "Video icon" in your meeting menu. Note: If you started your video during your screen share. When you click "Stop Share" your meeting will return to the "Video Meeting" mode. There are 4 video layouts for single-monitor. Click here to learn more. Note: You can move the drag and move the window layout at any time. When you are viewing a shared screen, it is in original size for optimal quality. You can click on "fit to window" during screen sharing to change the layout. Original size will maintain the original quality. Fit to window can reduce the viewing quality for the shared screen. There is also an option to set "fit to window' as default.